Emerald Coast Tree Service has been serving the Pensacola, FL community since all the way back in 1992. As the region premier tree removal service we have the experience and practical know how on the best way to approach the removal of large plants. All of our experts are trained to their finest and come equipped to tackle any problem that may arise. Our services include stump removal, so you and your family need not worry yourselves about tripping over exposed stumps. When we’re done trimming or removing a tree, our expert debris hauling service ensures that your lawn and property is left in a clean state. Emerald Coast Tree & Hauling Specialists has been proudly serving the Pensacola, FL area for over two decades now. 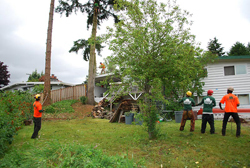 Over the years we have developed and honed an expertise about tree removal that is unsurpassable by the other companies. Just remember that when you need a branch removed or some bushes eliminated. Emerald Coast Tree & Hauling Specialists has the experience you need for even the most difficult of jobs.